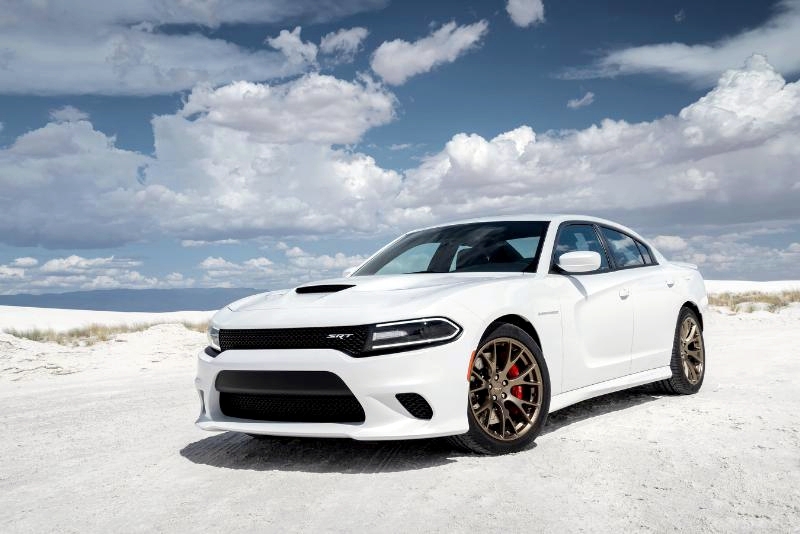 The exterior of the 2015 Dodge Charger SRT Hellcat, inspired by the iconic second-generation Charger from the late 1960s, specifically draws its cues from the 1969 model. Up front, the Hellcat receives a larger, power-bulge aluminum hood, which features a dedicated “cold-air” intake – a visual styling cue from the first Viper coupe built in 1996 – and dual air extractors. The redesigned front fascia and grille use unique, blacked out upper and lower textures to produce the menacing look. At the rear, a single piece decked spoiler is painted in body color while the unique fascia and valence showcase the 4-inch round exhaust tips. Filling the wheel wells are “Slingshot” split-seven spoke 20″, aluminum wheels with either standard Matte Black or available Brass Monkey/dark bronze finishes. Two new 275/40ZR20 Pirelli P Zero tires provide performance for all seasons. Both Pirelli P Zero Nero and P Zero tires are Y-Plus rated to handle the extreme speeds the 2015 Charger SRT Hellcat is capable of producing. The 2015 Charger SRT Hellcat’s driver-focused interior features premium, soft-touch materials, a new 7-inch thin-film transistor (TFT) customizable digital instrument gauge cluster, and a new instrument panel center stack with the latest generation 8.4-inch Uconnect touchscreen media center. A redesigned SRT-branded heated steering wheel include a flat bottom and thick rim for the high-performance driver and standard paddle shifters. The ventilated front high-performance seats with improved cushioning and more comfortable contours only enhance the driving experience.